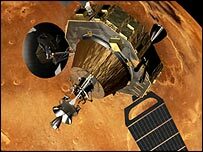 In 2016, ESA, the European Space Agency, will launch a telecommunication orbiter and in 2018, another spacecraft containing a rover: ExoMars, and in 2020, another spacecraft containing lander(s). The objectives of that program are the exploration of Mars by humans and more generally the development of a European long-term plan for exploration, by man or robots, of the solar system objects, including those that might contain traces of life. The Royal Observatory of Belgium (ROB) participates actively in the future Mars missions. Indeed, VÃ©ronique Dehant researcher at ROB, is the Team Coordinator/Principal Investigator responsible for the instrument LaRa (Lander Radioscience) to collect information on the interior of Mars, its atmosphere and understand better the formation, evolution and habitability of the planet. The future Mars missions aim at increasing our scientific knowledge about the planet Mars and our technology capability to land the spacecraft safely. The study of the interior of Mars in order to gain a better understanding of the evolution of the planet and its habitability. The preparation of samples for analysis and results distribution. 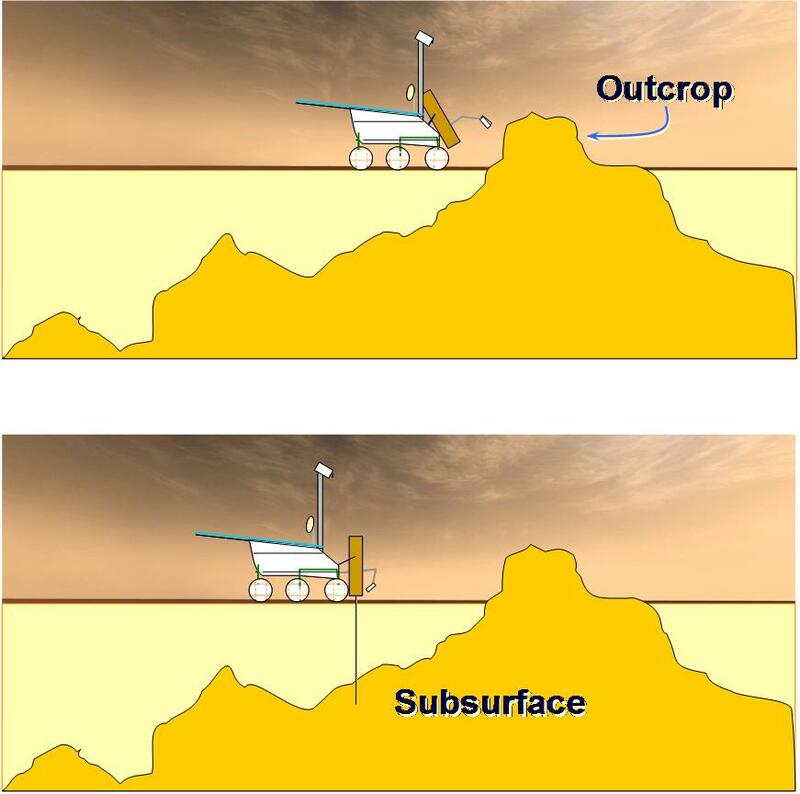 These objectives will be achieved by two sets of instruments: a first set on board a Rover, thus mobile, equipped with instruments for soil and sub-soil sampling (Pasteur payload), and a second set on a surface module/lander (Humboldt payload or GEP, Geophysics Environment Package). The travel to Mars will last about ten months. The probe will consist of the cruise module (CM) and the descent module composite (DMC). The cruise module will carry the descent module from Earth to Mars. It will orbit around Mars and wait until conditions are favorable to release the DMC. Indeed, there may be at this time of the Martian year tornadoes of dust that can damage the mission. At the right moment, the DMC will be launched on its particular descent trajectory. The module will continue its cruise trajectory, return to the atmosphere of Mars and burn, while the DMC will land on the surface of Mars and deploy the Rover or the lander. A cruise module (CM) that carries the descent module. A composite descent module (CDM) which makes entry into the atmosphere, descent and land on the surface of Mars. To allow a landing in optimal conditions, the CDM has a heat shield, a parachute system, a jet control system, descent thrusters and a lander. The landing can be done with a new airbag system that enables landing without bouncing. 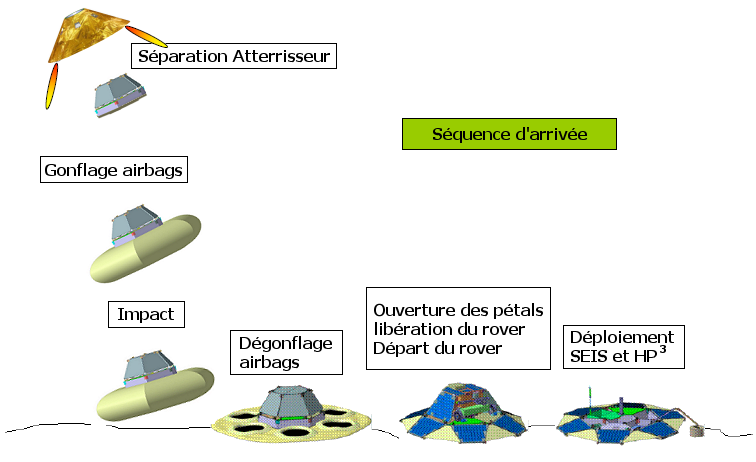 The advantage of this arrangement is that there is no need to surround the whole CDM with airbags as it was the case in previous missions, which represents a gain of space. Once landed, the CDM releases the lander or the rover. 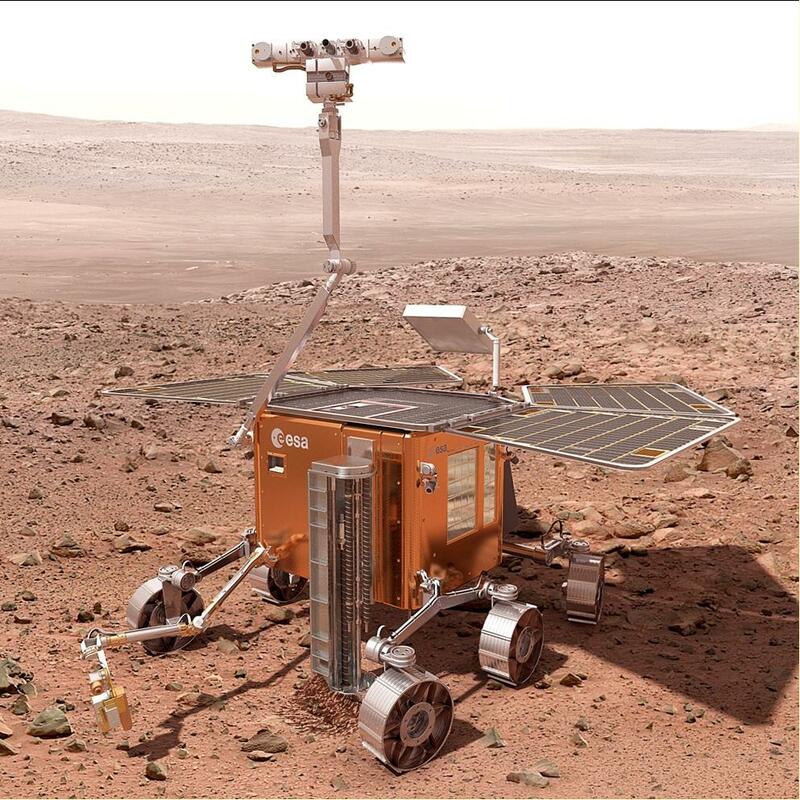 The ExoMars Rover is a 250kg Rover containing itself the 16.5kg Pasteur scientific payload. The future lander(s) deploys the Humboldt scientific payload. The Rover is a mobile robot with six wheels designed for research in geology and exobiology. It will travel several miles in search of signs of past or present life. It is responsible for collecting samples at and below the surface of Mars. It is therefore equipped with a drill able to sample down to two meters deep and a system that manages the collected samples, the SPDS (Sample Preparation and Distribution System). This SPDS prepares the samples, analyzes them and collect the results, which are sent to Earth. The Rover is also equipped with the payload " Pasteur ", made of eleven different instruments. The robot will use solar energy to generate the electrical energy it needs. Four solar panels covering an area of two square meters each help to survive the cold and the dark Martian nights. Equipped with panoramic cameras, it will have large autonomy, creating its own routes and avoiding collisions with the terrain if necessary. It will travel about a hundred meters a day. This autonomy is necessary because communications with Earth will be rare and short, only a two small sessions a day. The main objective is to analyze the composition of the Martian surface by a set of instruments in order to obtain crucial measurements to characterize the chemical and mineralogical composition and identify the geological and geochemical processes, endogenous and exogenous processes, alteration, differentiation, tectonics, volcanoes, volatile content and formation of rocks in the mantle and surface of Mars. Urey (optional) is an instrument designed for the research of organic components in rocks and soil of Mars as evidence of life. ARES is an instrument that captures the electric fields and determines the ionization of the atmosphere. Its purpose is to measure the electrical properties of the Martian environment. ATM consists in a series of environmental and meteorological sensors to study the atmosphere, the climate and its evolution, the environment of Mars and its habitability. EISS is a radar that will allow us to obtain the structure and stratigraphy of the subsurface of Mars from a few tens of meters to more than one km depth. The HP3 is an instrument that measures the heatflow in the soil of Mars to a depth of two meters. In the beginning, Mars was a warmer planet. But the heat is gradually draining. The details of the thermal evolution are governed by the amount of heat gained during its accretion, the abundance of radioactive elements and the nature of the convection process (movement on a large scale in the mantle of Mars). Knowing the heatflow in the soil of Mars provides a constraint on the abundance of radioactive elements and on the process of thermal evolution of Mars; this constraint will help us to better understand the biological evolution of Mars. IRAS is a spectrometer. It measures the radiations at the surface of Mars and shows their different types. This will determine the amount of radiation and the risks for a future human mission. dioscience) is an X-band transponder that will reconstruct the variations of orientation and rotation of Mars in space. For more details, click here. MEDUSA is a instrument designed to study the presence of dust and water in the atmosphere. Dust detectors will determine the movements of dust grains, their quantity, the variation in size and also the probability for a grain to be electrically charged. Understanding the dust devils (tornadoes) and the cycle of dust is important to determine the damage that dust can cause to instrument or to a future human mission. MEDUSA will also measure water vapor on the surface of Mars, and eventually can be traced to the source by following the gradient of water vapor concentration. MiniHUM includes two moisture sensors and two thermocouples to measure temperature changes in the soil. The aim is to understand the role of water in the last layer of soil, its influence on the chemical reactivity of the soil and to explain the daily and seasonal variations in the amount of water in the soil of Mars. MSMO is a magnetometer which measures the magnetic field of Mars. A long time ago, Mars had a global magnetic field like the Earth, generated by the rotation of a core of molten metal. But today, it no longer exists and it only remains a remanent magnetic field in very old rocks, fossil traces of the ancient global magnetic field. The measurements performed are thus that of the field induced in the planet Mars by the Sun and the field of the Sun. SEIS is a seismometer to measure seismic waves. The seismic motion on Mars are very low compared to those on Earth, there is no plate tectonics. Mars is considered as a planet at the end of its geological life. The interest of seismometers is not only to study the seismic activity in March, but also to explore the interior of Mars. Indeed, when a seismic wave appears, the time it takes for this wave to propagate in the convecting mantle and to reach the seismometer is measured. This time changes depending on the density of matter as the wave passes through. Knowing the location of the source of seismic activity, one can determine the composition of the mantle. UVIS is a UV and visible spectrometer which measures the amount of UV light arriving on Mars. Too much UV can lead to oxidation of organic components and therefore cause damage to all forms of life and possibly to a human mission. UVIS can also measure variations in the density of the atmosphere of Mars caused by the presence of dust.